National ISPs with millions of customers are some of the most hated companies in the U.S. Poor customer service, contract tricks, and a refusal to upgrade services are only a few of the common complaints from subscribers who are often trapped due to lack of competition. Frontier Communications is proudly carrying on that tradition of deficiency in Minnesota. In fact, the company’s excellence at skullduggery has drawn the attention of the state’s Public Utilities Commission (PUC), which launched an investigation into the service quality of Frontier this spring. Lack of telephone service for up to a week at a time. Poor quality telephone service, including missed calls and noise on phone lines. Subscribers charged for services they’re not receiving. Service visits that accomplish nothing but for which customers are still charged. Missed service appointments and long delays in getting repairs scheduled. Mistaken disconnections, service additions customers did not ask for, and service errors. Contract issues that include penalties for early termination, even if the subscriber told Frontier they did not want a long term contract. Auto-renew contracts that customers were never told about. Threats to customers’ credit if they don’t pay bills, even when there is a dispute regarding the charges. Customer service promises of discounts not being applied, penalties on disputed bill totals, and checks sent to Frontier but not credited to subscribers’ accounts. The PUC wanted to hold public hearings to seek out other information from subscribers and those who had previous dealings with Frontier. In order to limit the public spectacle, Frontier and CenturyLink filed comments arguing that the PUC had no authority to review Frontier’s performance. They claimed that the PUC was aiming to regulate Internet access and that such regulation was preserved for federal jurisdiction. The Minnesota PUC could not extend the conversation beyond landline telephone service, lawyers for the two companies argued. During the process leading up to the hearings, the PUC and attorneys for Frontier couldn’t agree on language for the notice of the hearings. Frontier wanted the notice to include some language referring to the jurisdictional issue. In an effort to be accommodating, the PUC allowed Frontier to draft a proposed notice that would have been included in subscribers' bills. Frontier pushed too far, however, drafting language that couldn’t get past the Attorney General’s office, even after multiple attempts. Rather than continue the charade that Frontier could draft a notice that was not shamelessly slanted, the PUC chose to do it themselves. Over the years, we’ve encountered many instances in which residential and business subscribers have had similar problems with Frontier. In addition to the same issues rural business and residential subscribers face, local municipalities and new entrants have had problems with the company. In places where community leaders or new entrants have taken steps to improve connectivity with their own investment, Frontier has taken the time to derail projects, even though they can’t take the time to provide better service. Most recently in 2016, when local company Woodstock Communications applied for a Minnesota Border-to-Border Broadband Program grant, Frontier delayed the project by asserting their right of first refusal. Back in 2012, Frontier also delayed the Lake County municipal broadband project over pole ownership issues. Frontier has increased the cost and interrupted momentum for new projects by perfecting the delay tactic. Frontier has also collected an impressive collection of complaints over the decades. While the most recent assortment is from Minnesota, other states with large swaths of rural regions have endured Frontier’s usual behavior, leaving a wake of complaints behind. In North Carolina, local media investigated. Ely September 4, 2018, at 6:00 p.m.
McGregor September 5, 2018, at 6:00 p.m.
Wyoming September 12, 2018, at 6:00 p.m.
Slayton September 25, 2018, at 6:00 p.m. If you’re a Frontier subscriber and, whether you’ve received the notice of these hearings or not, you probably have something interesting to share with the Commissioners. 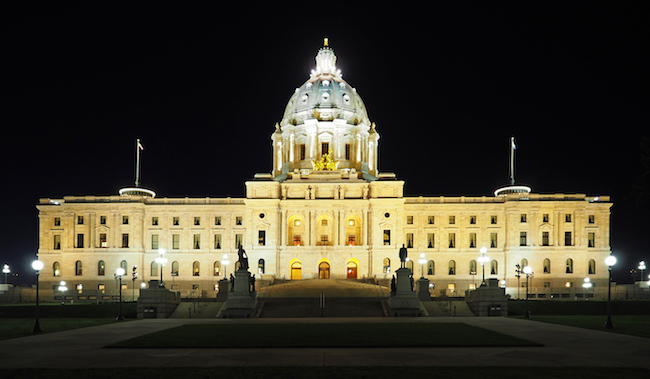 Image of the Minnesota State Capitol by McGhiever [CC BY-SA 4.0], from Wikimedia Commons.